EORTH in general is a painful disease. The most common initial sign of incisor pain is a reduced ability in grasping apples and carrots. Many horses will eventually become completely disinterested in these treats. 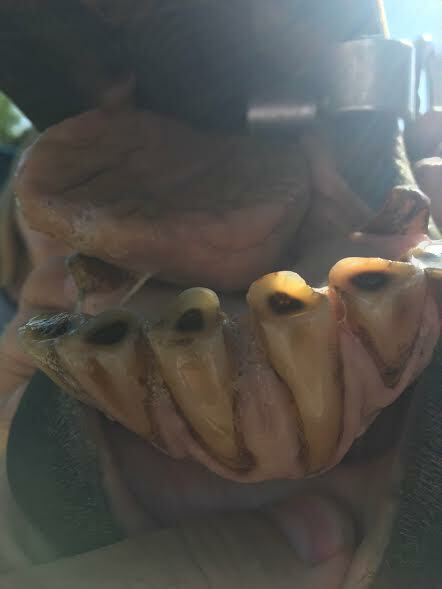 Other signs of pain associated with EOTRH include sensitivity to biting, head shaking, drooling, resistance to turning during work, shyness about the head, periodic inappetance, weight loss, and decreased use of incisors for grasping and grazing. Dental radiographs help confirm the diagnosis of EORTH, and can illustrate the extent of the disease process. Surgical extraction of affected teeth may be required, but some cases have been managed by simple taking the teeth out of occlusion using dental floats. 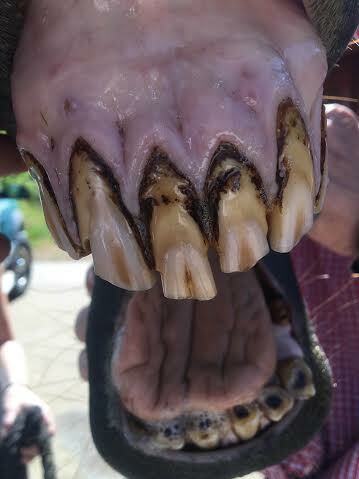 Full incisor extraction may lead to protrusion of the tongue especially when animals are at rest. Horses without incisor teeth have a high quality of life and most maintain their ability to graze on soft, fresh pasture. Should a full extraction be necessary, a nutritionally-balanced pelleted ration should be the main stay of the horse's diet to ensure adequate nutrition.